Historic House Tour Is Tomorrow Sunday, February 28th - Your once-a-year opportunity to take a look behind those old doors that hide the architectural gems and remnants of Todos Santos' glorious past is this coming Sunday February 28th. 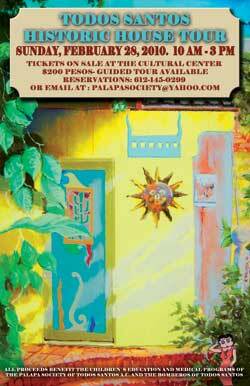 The Palapa Society's annual Historic House tour includes several new locations this year as well as several houses which have not been on the tour in recent years. 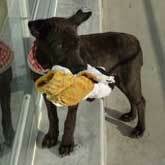 Approximately 20 houses, commercial and public buildings are open to the public from 10AM to 3PM. Tickets are available on the day of the event only at the Cultural Center on Calle Benito Juarez for 200 pesos per person. You will receive an identification band and a detailed map for a self-guided tour or you can choose to take a tour led by one of the local citizens who is knowledgeable about the houses and the history of the town. 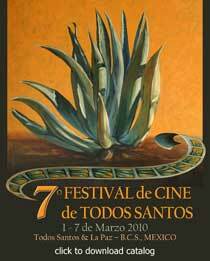 7th Todos Santos Film Festival March 4th To The 7th - Silent auction benefitting The Youth In Video program. This is an opportunity to bid for this exquisite painting which was used for the Film Festival poster..Come and meet the artist and enjoy a glass of wine. 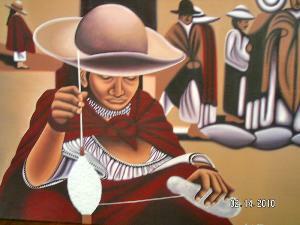 Tickets are available for the Festival at El Tecolote bookstore, suggested donation 50 pesos . There will be VIP priority seating for advance ticket purchasers 15 minutes before each film starts. All films have English sub titles. Please look at www.todossantoscinefest.com for all times and film details. Off Road Motocross Races - in Pescadero's Baseball Stadium at 4:00 P.M.
First Annual Gemstone Tour - Casa Bentley Gem Tour from 2:00 to 4:00 PM. Please note the Baja Western Onion will not reprint information that accuses or criticizes any individual, group or business that can be identified by name or description. The Baja Western Onion and its readers cannot be expected to know all the facts or take sides in a dispute. Legal, criminal or civil matters should be referred to the local authorities. For more information about our editorial policies, please see the FAQs section on our web site at: http://www.bajawesternonion.com/faq.asp. We appreciate your understanding. 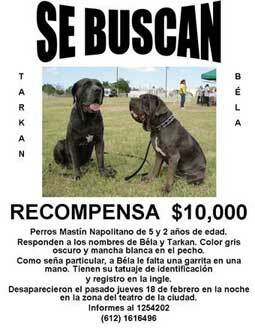 Perros Extraviados - 10,000 Peso Reward For Lost/stolen Dogs In La Paz (courtesy, La Paz Gringos) - Lost in the area of Teatro de la Ciudad, which is located at Navarro and H�roes de Independencia. Por favor, ay�denme a encontrarlos circulando este correo con sus contactos y estando alerta. Estos perros no pueden pasar desapercibidos. SE desaparecieron de su propio domicilio, probablemente sustra�dos. Linda Hamilton Designs Is Now Taking Orders For New Shipment - Linda Hamilton Designs is now taking custom orders for everything you might need for your home. 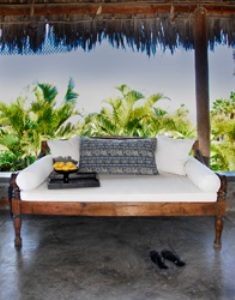 Anything from teak daybeds, custom rattan chairs & sofas, IKAT fabrics, mosquito nets in all your favorite colors, rattan mats, sculpture and just about anything your heart desires. What's In Your Water? - Whatever it is you can remove it. Reverse osmosis, also known as "Ultra filtration," or "RO," is the most advanced water filtration method available, and is the preferred treatment technology used by bottled-water companies and desalinization plants. Of all technologies used to purify drinking water, RO provides the greatest range of contaminant removal. The pores in a reverse osmosis membrane are only approximately 0.0001 of a micron in size (bacteria are 0.2 to 1 micron, and viruses are 0.02 to 0.4 microns). Our multi-stage, carbon and reverse-osmosis filter systems with built in Ultraviolet sterilizer provide ultra pure water protection for your family. Removes Arsenic, Cadmium, Cyanide, Iron, Lead, Mercury, Nickel, and Other Toxic Metals. Removes Pesticides, Fertilizers and Organic Chemicals. Produces Up To 100 gallons per day of fresh, clean drinking and cooking water. No more heavy bottles and jugs of water to lug home or return to the store. Open House Sat Feb 27th 10:00 A.M.-2:00 P.M. Otro Lado on Calle Los Jardines several blocks north of the blue maquina and one block south of Calle Internacional, Ocean side. Call Nicole 612 132 4152 for directions. Feb. 28 - 1st Annual Gemstone Tour at Casa Bentley Gem Tour from 2:00 PM to 4:00 PM. March 12 - Classic Rock Benefit Concert In La Paz - The Barking Dogs Band will perform in concert from 7 to 10 P.M. at La Costa restaurant (near Marina de La Paz). 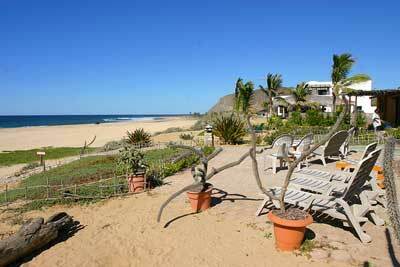 March 6 - Todos Santos Women's Pot Luck Lunch and Clothing Exchange at 11:30 at the pool at El Molino. 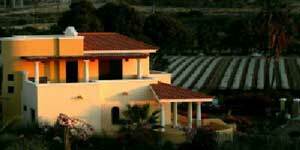 Mar 27 and 28 - Ejido El Pescadero Chile & Fresa II Annual Festival, from 10:00 A.M. to 7:00 P.M.
Yoga at Hotelito. with Caroline at 9:00 AM. Yoga at Hotelito. with Caroline at 3:00 P.M.